Are you looking for a modern living with space and light in a quiet location yet close to everything? Welcome to our new development Fairways La Cala Golf! 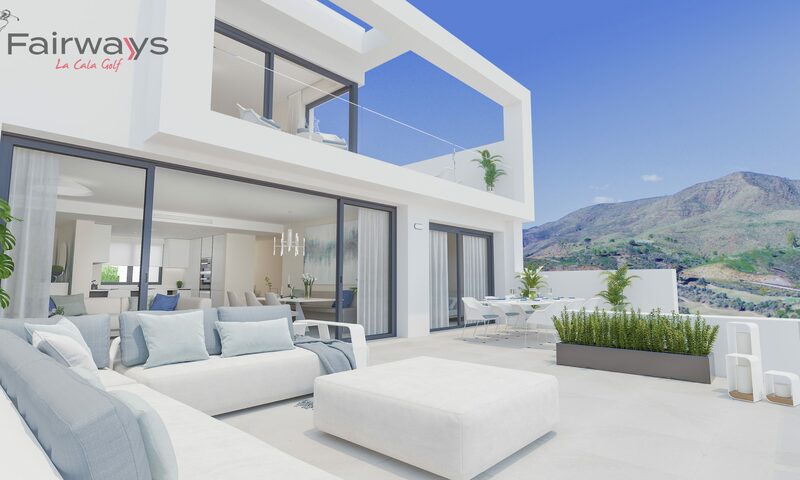 Fairways has been especially designed for today’s buyers – large terraces – lots of light – open plan – luxury materials -private spa and gym – contemporary design all in a beautiful setting front line golf but only 10 minutes drive to the beach! Apartment 621, a magnificent 2 bedroom duplex penthouse. On the first floor level you will enter a large 41 square metre lounge and dining area overlooking the 25 metre terrace with stunning views to golf and sea. 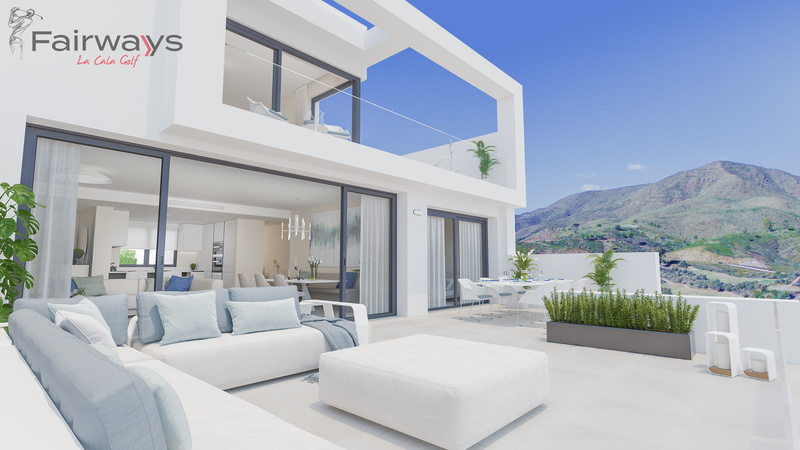 Your open plan kitchen and breakfast bar will also enjoy views across to hole number 5 on Campo America, and spectacular mountain views via the kitchen window. Also on the first floor you have the first bedroom to the right of the hallway with its bathroom to the left. The upper floor is dominated by the en suite master bedroom. This bedroom just under 15 square metres has ample built in wardrobes, a spacious and light bathroom with terrace doors leading to the outdoor shower. You can access the 42 square metre terrace via the bedroom, the bathroom, and for privacy when you have guests downstairs, there is access via the hallway at the top of the stairs too. With over 66 square metres of terrace you will have spectacular views to both the front and back of the golf course with distant sea and mountain views. The price includes private underground parking space and a store room.